Texas A&M student Christopher Luis Bolanos-Garza, 18, is arrested after police say he posted threats of violence online. A Texas A&M student has been arrested after police said he posted threats of violence online. 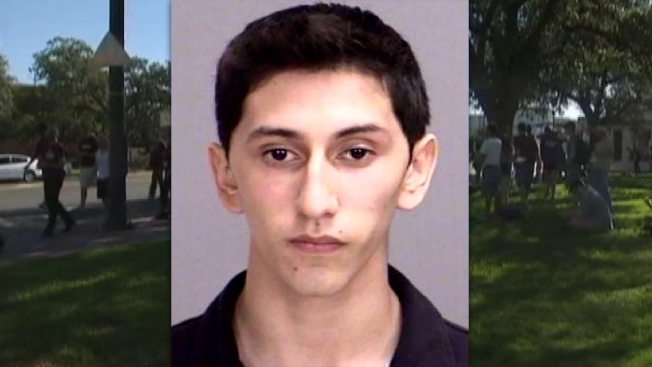 According to authorities, 18-year-old Christopher Luis Bolanos-Garza, of Humble, was arrested on campus and charged Tuesday with making a terroristic threat. University police say they received calls Tuesday about an anonymous post on social media website Yik Yak that warned people to not go to campus. Police said they obtained a subpoena for information from the website about the post and linked the message to Bolanos-Garza. Bolanos-Garza is being held at the Brazos County Jail on $8,000 bond. He faces up to 10 years in prison if convicted.